(first posted 11/2/2011) If this goofy-assed little car showed up at your premium brand’s doorstep and told you it was an unwanted orphan, would you let it in? And keep it as a foster child, or adopt it as your own? That’s the scenario Mercury found itself in with the Comet. And true to form, Mercury waffled. The Comet was planned as a compact Edsel, but when that expensive little venture went belly up, it needed a home. Mercury let it into its dealers, but not branded as a Mercury, just Comet. After all, Mercury had a finely-honed brand identity to protect: uninspired, overwrought, wallowing Buick wanna-be barges that sold poorly. It wasn’t about to let the Comet sully that. Was Mercury dutifully obeying the oft-repeated maxim against eroding a brand by extension? Perhaps. Mercury was in the depths of its perpetual self-identity crisis, which was exacerbated by the whole Edsel debacle. Ford wanted Mercury to aim up even higher, at Buick; thus the Comet solution. But two significant events changed Mercury’s mind. First, Buick came out with its own compact Special in 1961. In GM’s heyday in the 1920’s, when the various divisions each decided to expand and fill the gaps between them, their off-shoots were sold under new names: Cadillac spawned LaSalle, Buick birthed Marquette, Olds created Viking, and Pontiac itself was an offshoot of Oakland. GM has quite the cemetery of failed brands. But GM’s decision to let Pontiac, Olds and Buick have compacts in 1961 changed the rules forever. And soon there was the addition of premium Chevys like the Monte Carlo and Caprice. The GM brand muddle was in full swing. The second thing that changed Mercury’s mind was that the Comet sold quite well for the first couple of years, during those compact boom years. The real Mercuries didn’t. In fact the Comet outsold the big Mercs almost two-to-one in ’61. Probably explains best why the Comet became a genuine Mercury in ’62. The Comet was a stretched and re-skinned Falcon. Actually, only the sedans rode on a lengthened 114″ wheelbase and had that loopy rear end. 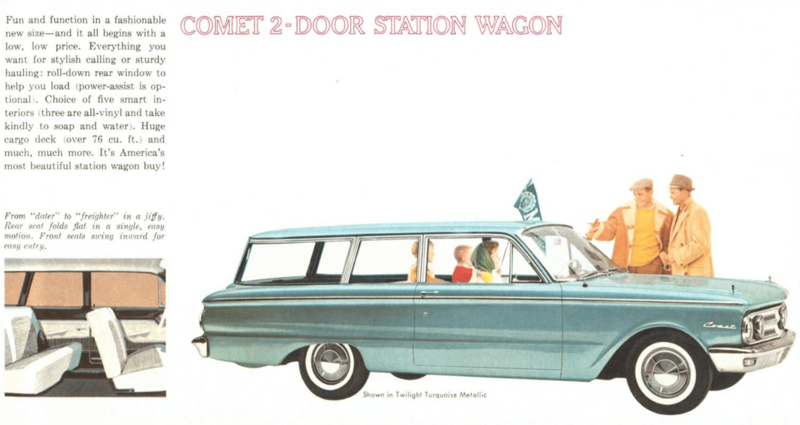 For cost-efficiency’s sake, Comet wagons were thinly disguised Falcons with a Comet front clip. Since Comets were planned to be Edsels, some parts still carried the “E” prefix. And the sedan’s rear taillight lens looks mighty similar to those on the 1960 Edsel. Except for the taillights and finlets, the Comet’s styling was actually way ahead of the whole Ford clan in 1960. It almost perfectly predicts the ’62 Fairlane and Meteor twins, as well as Ford’s general styling trend in the first half of the sixties. Of course, it wears that ’58 T-Bird roof proudly, like so many other Fords of the era. And by 1962, the Comet’s tail entered a more mainstream galaxy. Other than that longer wheelbase, the Comet shared its mechanicals with the Falcon. That meant only one engine for the Comet’s abbreviated first year: the 144 cubic inch (2.35973722 liter) six that packed all of 90 hp (gross) at 4200 rpm. That would be about 75 of today’s (net) ponies. That made it the feeblest of the semi-upscale new compacts. The two-speed automatic strangled that herdlet of ponies dead in their tracks. Good thing the slightly stronger 170 cubic inch came along in ’61, as well as the little 260 V8 in ’62. But with a stick and a glass-pack muffler like this one, the little six at least sounds like it’s making half-way decent forward progress. There’s a distinctive tone to these small Ford sixes. If they’re wheezing through the stock muffler, especially when burdened with the automatic, it’s very nasal, as in dire need of an antihistamine. With a less restrictive muffler, it reminds me of European and other vintage small displacement in-line sixes, like the old Opels, the Triumph six, and others of the period. It’s a pleasant, roarty throb, but smooth and obviously harmless. Mercury should have been very happy to have the Comet show up when it did, as it injected some very badly needed zip to its languishing sales. In its short first year (1960), 116k Comets found a home. 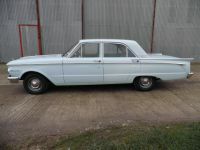 In 1961, which would be the Comet’s all-time best year ever, 197k were sold, which not only beat Mercury’s large cars by a a huge margin, but the Comet actually outsold the Valiant, Lancer, American, Lark, Tempest, F-85 and Special. It was the #3 selling Compact behind its cousin Falcon and the Chevy Corvair. Quite the success, actually. But like its namesake, the Comet’s sparkle was short lived. Once it earned itself the Mercury name in 1962, it became a slacker, and sales began a long decline. Maybe the Mercury name is a jinx. The ill-fated mid-sized Meteor, which appeared in 1962, didn’t help. It was a lightly reskinned Fairlane, but because the Comet was already a lengthened Falcon, it was almost mid-size itself. The Comet and Meteor were almost indistinguishable, and it all devolved into a typical Mercury muddle. It was not the winged god that gave Mercury its name; it was the mineral: it’s impossible to give it definition, and it’s deadly. For a few years starting in 1964, Mercury tried to inject some performance vitality into the Comet, including some wild factory-supported drag racing Cyclones. Amusing wheelie machines and cult favorites, but they didn’t really help sell the metal on Mondays. By 1966, Comet morphed into a mid-sized car, which then became the Montego. And by 1971, the Comet’s highly irregular orbit was completed, and it suddenly reappeared as a badge-engineered Maverick. 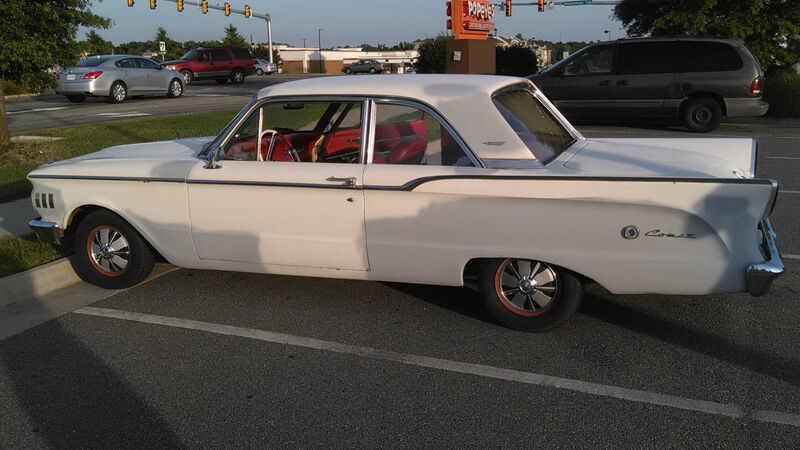 A buddy of mine in college had a ’63 Comet with the six. Great looking sedan, it was — but dangerously slow. I mean, a slug has better acceleration. you pick your routes carefully without hills..so you make it there…loaded semis always outran my six…it is why my 62 wound up with a Shelby driveline over time. Something happened that it needed a new head gasket. Her husband – also a co-worker, asked be if I’d be willing to do it for, like, $25 plus parts. Of course as a 6 it was a dirt-easy repair. I just remember finishing up, hitting the key and watching the temp gauge pin itself on “H”. About 2 minutes of diagnosis…2 minutes that seemed like an eternity…and I found the culprit…the feed wire to the temp sensor had ended up between the gasket and the head, grounding it. I was never so thankful to get it going again and have everything work properly. I think they were still driving it when I left for college a year later. Amazing it didn’t leak or pop again soon after! I once had a 2 day love affair with one of these as a teenager. I saw a black 4 door for sale. The 144 6 and three on the tree. I talked the owner into letting me drive the car across town to let Howard, my car mentor, take a look. It was fun to drive, but slooooooow. I cannot imagine it with the 2 speed auto. I do remember the bad combination of an underpowered car and vacuum wipers. The interior was actually fitted out fairly nicely, in black and white vinyl. It presented much better than a Falcon. The car, in truth, was a worn-out piece of crap. Something in the latch was busted so that the trunk would not even open. Howard gave me that look that said “please explain why you are wasting both of our time?” I took the car back to the owner and told him that I was not interested. He was not happy with me. A decent one of these (with the stick) would be a great car for me right now. I live a mile from my office and much of my driving is local. I always thought that the 60-61 Comet was an attractive car. I kinda like the cat’s eye taillights. This would make a nice short distance cruiser today. Edit – I just noticed: what a fascinating fuel filler cap. Neither decorative nor hidden. Just kind of – there. Also, I wonder if the 5 letters in the Comet name was just coincidence, or if the body panels had already been engineered and tooled for holes to accommodate the 5 letters spelling Edsel? The Edsel lettering was indeed replaced by Comet lettering because the letters had already been designed. The Comet had a “C” on the keys that was an Edsel “E” with the bar of the E removed. The decision to drop Edsel must have come very late in the development of the Comet. It’s pretty simple to compute cubic inches to liters. There is 61 cubic inches in one liter. So, 2.3606557 liters equals 144 cubic inches. You’ll find variations when manufacturers want to round off their displacements for advertisng purposes. A GTO 389 V8 actually was a 6.377 liter motor, but the emblems call it a 6.5 liter motor. Ford called their 260 V8 a 4.2 liter motor, but lately, British car magazines correctly use the rounded-off figure 4.3 liters for describing Sunbeam Tigers and early Mustangs. ine hd van) and a 4 pinion equalock. a very fun car!!! A Maverick Comet shouldn’t be hard to find – they were quite popular in their time in the Midwest. I thought, and I wasn’t alone, that the trim and touches were a better combo on that unit than on the Maverick. I don’t have production numbers; but they shouldn’t be uncommonly scarce. I saw one in the local pick-your-part about a month ago, a baby blue sedan with blue vinyl interior. I think it was a ’75. The really rare 1970s Mercury variant was the Bobcat. A friend of my dad’s borrowed his brother’s once, it was a seafoam green hatchback. That was in about 1990 and that’s the only time I recall seeing one. Picture a Pinto with a Marquis grille, and that’s it. Believe it or not, I’d seen quite a few Bobcats around, also. I think it was that we, on the West Side of suburban Cleveland, had several very aggressive and successful Lincoln-Mercury dealers. And when the 1973-74 fuel crisis hit, ANY small car was selling. My old man got his Maverick at that point, and was lucky to do so. It was one of only a few not pre-sold on delivery. During that search for a thrifty car, my mother had looked at Pintos…and also Bobcats. Vegas were off the search because they’d already established a reeking reputation. But, no, everyone wanted in a small car…a friend’s mother bought a two-year-old Pinto, same time. FWIW, the Mercury Bobcat Pinto-derivative hit the States as a 1974 model. It was sold in Canada at least a year earlier; maybe several model years earlier. EDIT: I just checked Wikipedia; and they claim the Bobcat was a 1975 introduction. But I remember a write-up in Car and Driver in August 1973. I remember that well because I was NOT a subscriber; couldn’t afford it as a 15-year-old kid. It was a purloined issue; a rare treat. And I do remember Bobcats, with their odd taillight treatment, being around at that time. It was a brief time when all the world wanted to drive small; the only new cars on the street were little cars. Back in the day I had a number of Pintos and one Bobcat a ’75. They certainly didn’t sell in anywhere near the numbers the Pinto did. The 75 Bobcat was an early intro in Apr-May 1974. I was just thinking that: An early-early 1975 introduction. Rushed into production because of the gas situation in 1973-74. I know I’d seen them in spring 1974. I like it, just for the sheer weirdness of it and even though it sold well during it’s first few years, having one would likely elicit many “WTF is that?” responses from observers. Yessiree, these are yet another reason I’m proud to have bad taste in cars. Love the fins and goofy taillights, and that crease on the side that dips down. And that generic 60’s grille and headlight treatment. You can have more fun with one of these than that engineless 428 CJ Mustang over on Hemmings Blog, and since I’m all about fun with cars and who cares who is impressed, this pushes all the right buttons for me. heres mine. having a hell of a time finding lower ball joint/control arms. If this poor little thing showed up at my door, of course I would have to adopt it – after all, someone adopted me! I’d take this because it looks better than a Falcon, which is good, and I like quirky-looking cars too. Yes, send it my way, to West Chester, OH, and I’ll drive it to our spring meet-up in Van Wert! 1)On the topic on if this looks better than the falcon, I would say definitely knowing I am slightly quirky in ways. 2)On if I would foster or adopt it if it showed up at my front door, I would say yes because my youngest sister is adopted. In other words: Great choices Zackman! Ford didn’t have a whole lot of time to de-Edselize the Comet. It certainly seems to be a reasonable hypothesis to imagine that the lettering spelling out “C O M E T” below the decklid was placed where “E D S E L” was originally intended. Unfortunately, there don’t seem to be any extant photos of Edsel Comet styling studies showing a clear view of the rear. Below is what the front of the Edsel Comet would have looked like. With a bit of metal fabrication skill it ought to be possible to duplicate that. 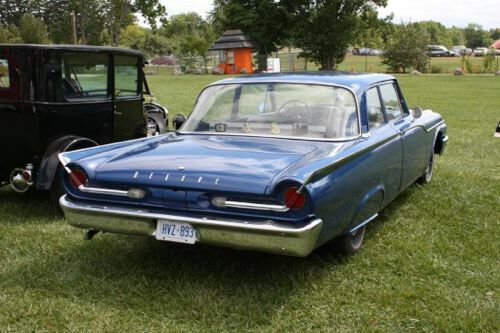 Add in some badging from 1959 and ’60 Edsels and tada, you have a “what-if” ’60 Edsel Comet. I’d like to see someone do it. Looks a lot like a Tempest. I wonder if they still would have called it a Comet if it was going to be sold under the Edsel nameplate, they rear probably would have looked the same since the tailights on the Comet look a lot like the eyebrow tailights on the 58 Edsel. It was going to be called the Edsel Comet. I read the article on the ’60-’63 Comets in Collectible Automobile a while ago, and the decision to cancel the Edsel came so late in the Comet program that they had to replace all the brochures, advertising, and service manuals to remove the name ‘Edsel’. The neon C-O-M-E-T signs for the outside of the dealerships had to be modified as well. According to some sources, not only would it have been an Edsel Comet, it would have been the only Edsel by 1961. Which raises the question of what would have become of the Fairlane-based Meteor had Edsel survived. That probably would have become part of the larger question of where to position Mercury, which was bad enough without Edsel but would have been even worse with it. I can envision an alternate universe in which someone would think it a good idea to make Edsel the small car division of Ford. I suspect that would have died out due to the LaSalle problem — someone would realize that the cars would sell better branded as Fords or Mercurys. Ironically, Motor Trend at that era once speculated then the 1961 only DeSoto would had been a Valiant variant. I spotted this image on the Forwardlook.net forums. When I think of Mercury Comets I can’t help but think of a 65 or 66 Cyclone. I was living in Argentia, Newfoundland and it was one of those new cars that came in with an arriving Nurse. She made the mistake of loaning it to one of the sailors who made the mistake of wrapping it around a pole. A copius quantity of alcohol was involved during the middle of the day. I was working at the Station Hospital emergency room and got to see the whole situation play itself out. I had thought it was a little overpowered for the roads on base even if you were sober. Hi Po 289 IIRC. Possibly the reason I had noticed the comet so much was that I was driving one of it’s underpowered ancestors, a 1953 merc with a flathead eight. I couldn’t keep it out of the repair shop and it drove me right into the arms of a waiting new 1966 1300. BTW, I could have bought the 1200 which you couldn’t do in the states. Just couldn’t take it home. I’d take it! I liked the less frumpy looks of the Comet over the early Falcons. Slap in a Turbo 2.3, T-5, an 8.8 rear and you have a heck of a little car. Sunday afternoons when everyone else (including the town constable) was sleeping or watching NFL. Dad’s ’68 Catalina walked away from it on the “straights,” but that little Comet tail would kick up around the corners and somehow hang on and easily make up for lost time. Tough little car; we couldn’t kill it. Made me think about overall weight and balance as it related to handling, probably began my lifelong preference for smaller, lighter vehicles. This is one of the cars I always search for on Craigslist. I like the canted fins and tail lights. I’d go with a vulcan 3.0 and 5sp for the power train. Make mine a 289, please. Although a later 200 I6 would probably be a simpler swap and would be plenty of power vs. the little 144. Maybe. I had a ’70 Maverick with the 200 cube six and it was still a wheezy, unenthusiastic powerplant with a carb that was difficult to keep set up properly. I’d second a Vulcan V6 swap, 150hp Net is probably more than the 260 V8 made in Net HP, and I’d assume the Vulcan is a lighter engine (and a good one, I always liked the surly exhaust note of them). A swap out from a wrecked post 1994 Ranger perhaps? My wife’s Taurus has the Vulcan in it. Ick, gaaak, who on earth can like that noisy, rough, agricultural device? It makes a GM 2.8 seem like a dream! HA! The last of the Vulcan powered midsize Taurus’ that I’ve driven (and I’ve driven quite a few in my district) are heaven compared to the 3.4V6 in the Equinox I often get to drive. Try merging on the Interstate and seeing a 3.4 tach up to 6,000 RPM where it is certainly not happy! I’m always waiting for the damn thing to explode on me. There must be something wrong with yours the one in my wife’s Taurus and her mother’s Ranger is not rough or that noisy. 2 big reasons I’d go with it. #1 they are one of the most durable modern bent 6s, change the oil every year or so and they’ll go to 250K or more. #2 because are durable and common as dirt they are as cheap as dirt, $250~$350 for a low mile example from the wrecking yard all day long. The other lesser reason is that they, and I know this will make me “unpopular” with some, is that there is a FFV version. My wife’s is a FFV and I like that option, gives a nice boost in low to midrange torque and at the right E% 40~50% it actually gets better MPG, about 12%, while making that extra power. For that reason normally when one of use heads to Portland and beyond we always take that car. A little less than 1/2 way there is a station that sells E85, not common around here, for a good price. The funny thing about that station is that I keep running into people from OR filling up their Marauders, and of course if I’m at that station my Marauder is at home. I had a ’66 Mustang with a 200 Six. Freshly rebuilt, with a three-speed bolted on back, it was actually pretty fun to drive. I think that the 200 cid version of the little six is best. My ’70 Mustang with the 250 cid / auto. was plenty powerful (read that adequate), but was very thirsty, at 15 mpg. (freeway mileage) at best. The lightweight Falcon six started at 144 cubes and grew all the way to 250 cubes. I think that this was too big for the rudimentary carb and manifold design. I found a complete three carb conversion at a swap meet and the seller wanted 1,500 dollars for it. More than I paid for the car! Who knows, another old Mustang may be in my future. I had a late 1970 Maverick. It was a Grabber with the 200 CID six and 3-speed automatic. The carb was a simple 2-barrel. Late in the fall of 1973, I decided to clean the carb. As a result, she started easily every morning of a very cold winter. Parked in the street and facing west, my father marvel at the Maverick being the most reliable car in the neighborhood that winter. The Maverick’s simplicity and sporty design (sloping roof and bob-tailed) made it a perfect 1st car. Customization? The Grabber package didn’t need much (only the late 1970 Grabbers came with a Mach 1-like 3-spoke rim blow and wood-grained steering wheel). 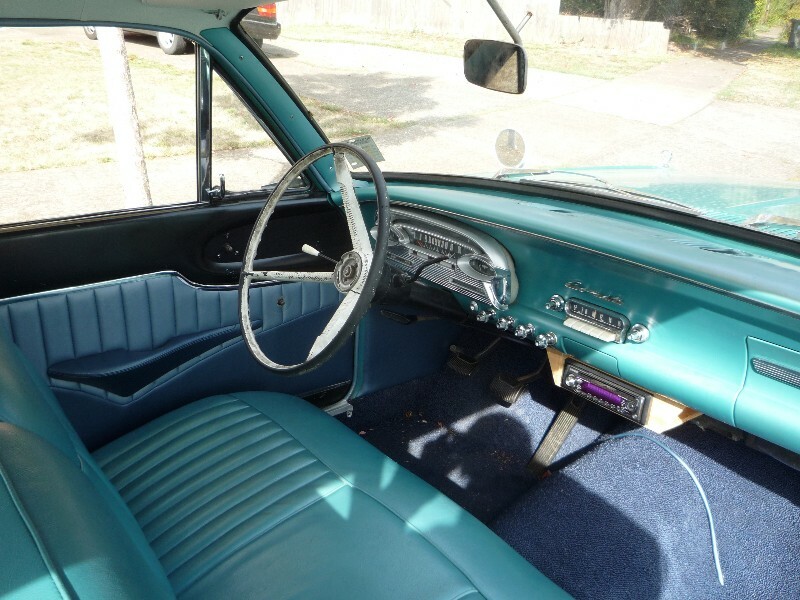 As with all 1970 Mavericks, it had a package shelf instead of a glove box and no clock. So, I reclaimed a 1974 Mustang II digital clock from the local junk yard, fabricated a face plate from a plastic aftermarket mud flap, and installed it in the shelf… immediately to the right of the radio. I also added a rear window defogger. My 1970 Grabber was replaced with a 1973 Grabber. Ah, the luxury of bucket seats and a real glove box… but the 250 CID six provided no performance improvement as emissions laws robbed it of its potential. 200 six with alloy head, triple carbs, and a five speed stick. That would give it a nice period set up with a little modern twist. Add a true dual exhaust set up, but not too loud, so you can still hear the trio of carbs for a killer “sound” system. Finding a 71-77 Comet shouldn’t be too difficult, but it probably will be a 4 door! That sounds dangerous. What if the guy was passing another car and then saw somebody coming and needed a little power boost, hitting the governor and causing an accident? A college roomate had one of these in 1973. We called it Kohoutek, after the other comet that was in the news that year. Kohoutek was a great little car, carrying us through all manner of hijinks and shenanigans. I remember these driving around when I was young. The rear end was nowhere near as ugly as the same-vintage Valiants however, some of which I seem to recall had a hideous fake spare tire outline on the trunk lid. The late 50’s – early 60’s time period certainly did produce some outlandish designs! Soon to be replaced by the smooth-sided blandmobiles of the mid 60s. Wow, that’s a nice find! I just love the early Comets, from the rear 3/4 it’s mini-’59 Ford, from the front a ’62 Fairlane. These cars look even better to me now than they ever did. A 4-on-the-tree with — would a 300 I6 fit under that hood? Remember this is an early car, the one with the suspension that the land down under destroyed pretty quickly. Of the top of my head I don’t remember when the Aussie spec strengthening of the basic front suspension and uni-body made it back to the US built models. Yes most of the early lessons learned like larger ball joints sturdier torque boxes did transfer back to the US built models. That is why I’m conflicted on these earliest US models they don’t take the same easy disc swap, either using later model or aftermarket parts. Yes the US kept different brakes and wheel patterns different between the 6 cyl and V8 cars but the US volume was quite large so they had to run multiple lines so they were able to lower costs for the 6cyl models. In OZ I don’t think they had the volume necessary for multiple lines so a one size fits all was more economical and better suited local conditions. 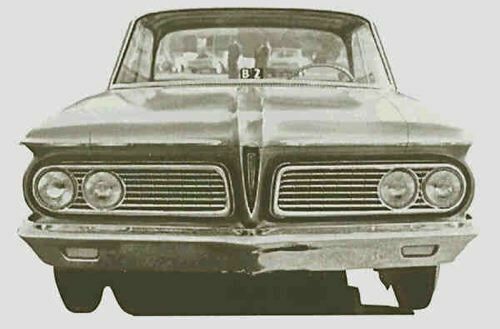 It is interesting that the early Comet front clip panels were re-used for the 65-66 XP Falcon in Australia, with a unique grille. The rear panels were unique though, big pie plate lights and a squared-off trunk to improve space. I have seen one or two later Comets but I don’t think I’ve seen an early one. I never knew that these were available with four-on-the-tree. I do know that the 1963 Falcon and early Mustang sixes got an English-Ford-derived 4-speed transmission but thought they were floor-shifted. 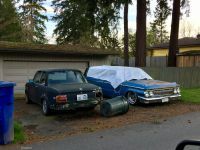 I note that the coupe shown has a rear Oregon plate that looks like it was installed just before photo time, and a front plate that’s too worn to be readable in the photo. The Zephyr had a tree shift standard but floor shift could be ordered or just get a Hurst inline. 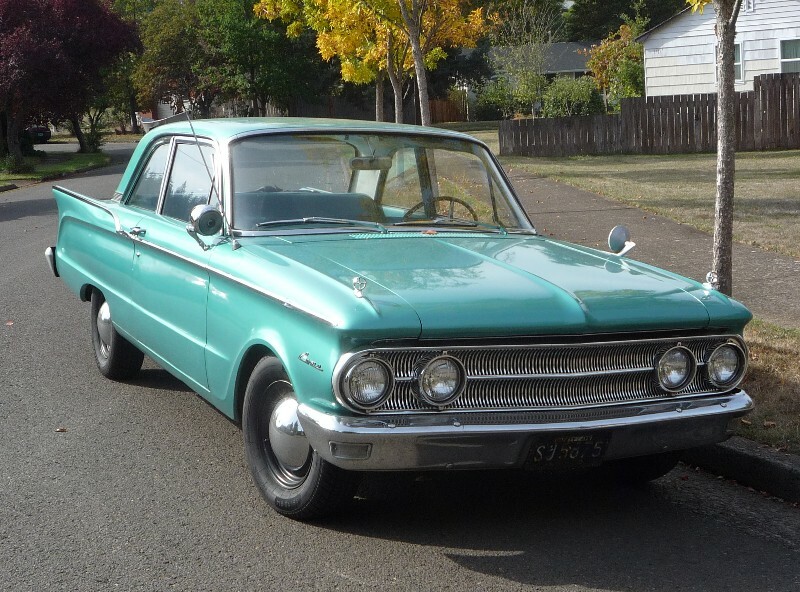 As for the Comet sales who begin its slide around 1962-63, I guess the intro of the Fairlane for ’62 as well as a redesigned Dart/Valiant at Chrysler as well as the Rambler Classic/Ambassador for ’63 didn’t helped things either. I love the way these look – especially the fins and taillights on the 1960 and 1961s. The one you found is especially sharp! Mercury also had a version of the Falcon Futura, the Comet S-22. It had bucket seats, console, special wheel covers and color-coordinated carpet, seats and instrument panel. It’s worth noting that by the time the Comet was conceived, Edsel had been rolled back into Lincoln-Mercury (which happened in January 1958). So, it was only sort of an orphan, although obviously it was caught up in the ongoing debate about what to do with Edsel (and Mercury, for that matter — the decision to try to move it upscale had been a controversial one). From a divisional standpoint, it would have been M-E-L’s car either way. Mercury had really not done badly until the recession. The problem was that it just couldn’t compete with Pontiac, Oldsmobile, AND Buick, in part because Lincoln-Mercury didn’t have the dealer base (one of the things the Edsel was originally supposed to address). Aside from the recession, they also had to deal with Ford Division moving upmarket, with cars like the Galaxie and Skyliner. I suspect part of the reason the Comet lost steam was the arrival of the Falcon Futura. Part of the appeal of the Comet was that it was just more nicely trimmed, where the early Falcons were obviously bargain basement. The Futura addressed that issue, and Mercury didn’t have the badge prestige to make the case for buying a Comet instead. We had a neighbor back in my childhood days, whose wife drove one of these old Comets. She even wore the cat’s eye style glasses, way after they were out of fashion. I remember the car, because it managed to survive late into the 1970’s. Of course by then, it was a patchwork of bondo, fiberglass patch and roofing tin pop riveted to keep the car fairly watertight. Makes me want one, toss a ford 300 six in their and drive it. Looks like a cross between a Falcon and a 60’s full size car with fins. I love, love old Comets, were one of my favorites when I was little kid in 60’s. And I had a model of 64 Comet drag car. 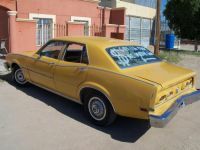 The Maverick based 70’s Comet was first true Mercury/Ford badge job, no unique sheet metal at all. And recycled 70-71 Montego tails. Great shots. I passed one of these, in the exact same colour/trim, nearly every day on the way to elementary school as a kid. That was the ’80s, so it was an antique even then. The owner always parked nose-in, doubtless to show off those hawt fins. I drive mine all the time, the 170 six banger runs all day at 65 mph with no complaints! 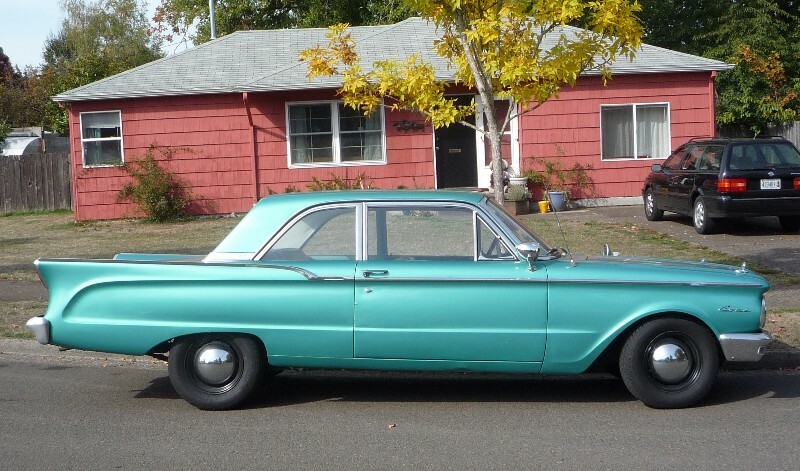 My first car was a sky blue 1960 Comet that my Aunt sold me for $100.00. That was in 1967. Drove it for three years, sold it to someone who made a point of driving by my house for three more years to show that it was still running. A great car. I had no idea until now that it was such an odd bird of a vehicle. CC Effect … I saw a clean red 2 door Comet, 3 on the tree, parked at the grocery store last weekend. It was parked next to a later model Civic, not much difference in size, visually. But the tail fins sure stand out in a 2017 parking lot! Re-reading this, it just now occurs to me that besides the Thunderbird, this car had the most attractive roofline of anything built by the entire Ford Motor Company in 1960. The 59 Galaxie had adapted the T-Bird roof very nicely, but then the 60-61 Fords backed away from that now-classic shape. By 1962-63 that roof would be on virtually every car FoMoCo built. But in 1960 that roof would have made the Comet one uniquely attractive car. Agreed. It previewed every other Ford to come. That’s probably because of the last-minute redesign from the Edsel version. 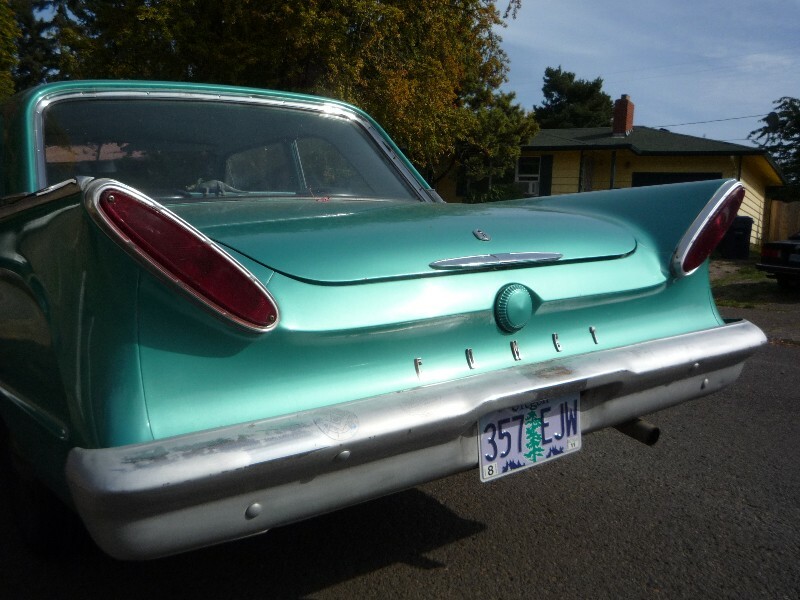 The taillights are charming in a goofy way way, but if the Comet had come out with the rear end it got in 1962, it really would have been a style leader. Love your writings man. I wish I had more time to devote to the various whips I see out here in the PNW. Next time I’m down in PDX let’s beer it out bro I’ll be in touch! The Comet NOT being branded as a Mercury it’s first year or so wasn’t really all that big a deal. The Valiant was NOT branded a Plymouth during the same time period. And I’m a little fuzzy, so probably “off-base” but in Canada a “variant” of the Falcon was sold as the Frontenac. The Frontenac was a “stand-alone” brand for it’s 1 year of existence. From the rear, it’s a quick sketch of a barely-remembered dream of a never-before-seen ’60 Valiant. I never, ever liked those ’61-’62 slanted taillights. Compared to the full-size ’60 Mercury, with it’s lingering ’50s-dinosaur styling, the Comet was a breath of fresh air. The Comet’s sales figures for 1960 are even more impressive when the late introduction is taken into account. My mom’s best ladyfriend had a black ’61, cool tails and all. So did lady we bought our first house from in ’64, though white. The author shows a way with words for which I am envious. This sentence sums up the entire Mercury line from 1939 until its; 200? demise. Sad, really…every once in a while, Mercury would rear back (more like Thor) and throw a Marauder into the mix, or a first-generation Cougar. Most of the time, they had no clue where they were or why they were there. 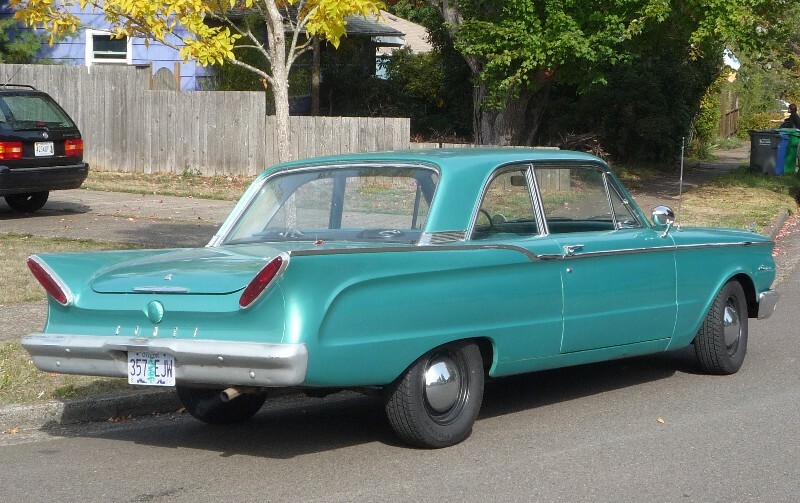 If it started out as a Comet and later became a Mercury Comet, then it followed the same path as the (Plymouth) Valiant. My old man was a Ford guy and would regale us with tales of one of his first cars, a ’39 Mercury with the Columbia 2 Speed rear end. This was in pre-war Southern California during the birth of the first real hot rod era, which sadly was pre-empted by the Nazi cancer spreading across Europe and finally by Pearl Harbor after which the U.S. could no longer stay out of the War. I always thought Mercuries were cool, really another unique part of American culture. Some of the designs were better or more appealing than others but at least they were instantly recognizable as Mercuries or if not made you do a double take to see if it was the Ford model or its Mercury corollary. And I don’t care what anybody says, those Colony Park and Commuter wagons from Mercury in the fifties and sixties are super cool as are the Marauder and early Cougar designs! 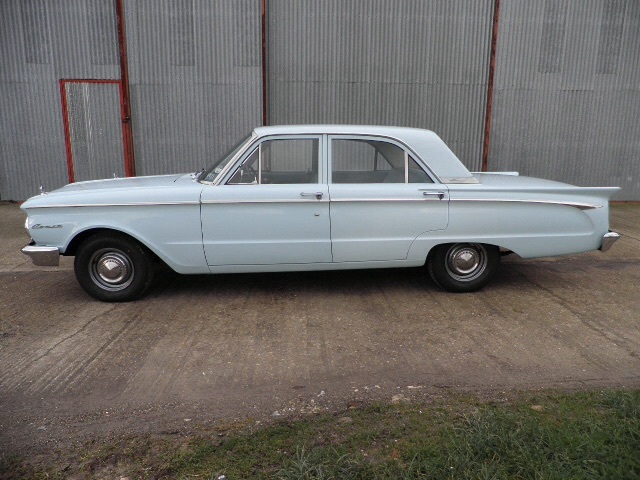 The early Comets are among my favourites as my father’s first car was a 1962 sky blue four door sedan. Straight six, Three on the tree, hubcaps, plastic seat covers, driver’s side mirror mounted on fender but no radio. If I take a moment I can remember the smell of the new plastic and the aroma of the rubber floor mat. Dad likely picked the Comet over a Falcon because my mother’s cousin had a new 61 Comet sedan which we rode in now and then. The Comet took us everywhere including two trips to Ontario and the eastern US. Ran fine for years until dad replaced the Comet with a 70 Olds Cutlass Supreme hardtop. I was able to enjoy the Comet until skidding not into a brick wall one winter day fooling around with friends. Good thing we had the Cutlass by that time. Dude no way… a Meteor and an ’02 in the same driveway spotted this weekend.